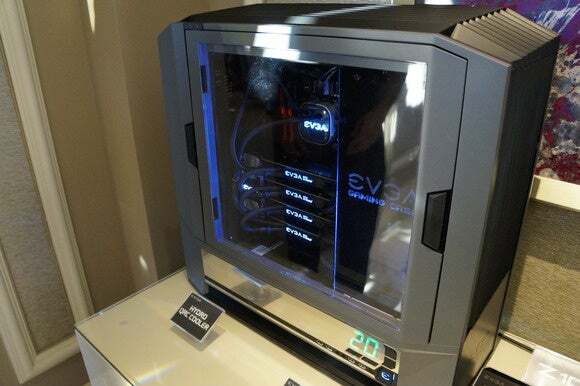 EVGA's beast of a full-tower sure is a beauty for gamers. When EVGA decides to do something new, it sure doesn’t mess around. The company exploded onto the laptop scene at CES 2016 with a sleek, powerful 4K gaming laptop—but that wasn’t the only trick up its sleeve. Meet EVGA’s new full-tower gaming case, a hulking chassis designed to eliminate some of the biggest frustrations in a gamer’s life. 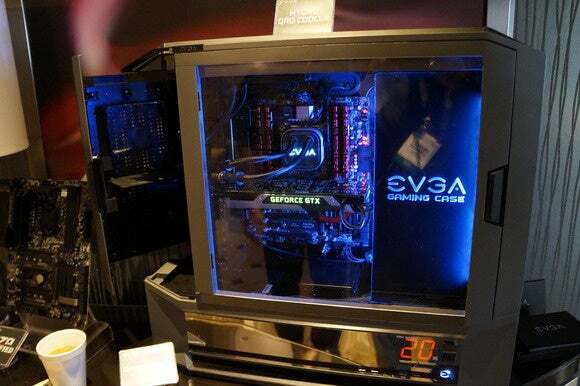 The first thing you notice looking at EVGA’s case—which is still early in the development life cycle—is that it’s big. Really big. Big enough to shove four graphics cards and a liquid-cooling system in there kinda big. But the second thing you’ll notice is that all of the cases’s ports and buttons are on its left side, underneath the clear window that lets you gaze at the PC’s innards. That’s no coincidence; EVGA says (and I agree) that many PC gamers actually turn their systems sideways so that all the beautiful hardware inside is on full display—making ports and buttons on the front of the case practical in theory but a headache in practice. Placing the buttons on the side of the case, under the window, alleviates that gamer-specific headache. The EVGA gaming case with the rear panel popped open. Notice the digital fan speed indicator. Likewise, nobody enjoys fiddling with screws when they’re just trying to swap out some hardware. Thumbscrews are a big improvement over traditional screws, but they’re still screws. Not on EVGA’s case, though. This chassis has large buttons that you push to pop open the front, rear, and side, providing easy access to the interior. Again: Another headache, solved. Finally, this case was built for gamers (which makes sense, as EVGA is one of Nvidia’s largest GeForce graphics card distributors) and gamers demand cool temperatures. EVGA's case was designed with maximum airflow in mind, going so far as to have a massive mohawk-like row of black fins running the length of the case. There are large gaps between each fin to let air flow through and out of the system cleanly. 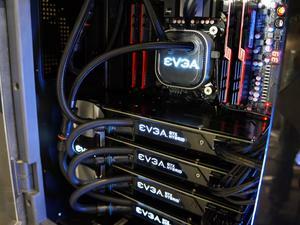 EVGA says that between that feature and the case layout, it’s seeing temperatures run 6 degrees cooler in its chassis than in traditional cases during the company’s internal testing. That sounds pretty damned impressive, but we’ll have to wait a while to see if those lofty cooling claims hold true. EVGA’s case is still in the early stages of development, and the company won’t commit to a launch date beyond “2016,” alas. But it’ll have one extra nicety when it does go live: The grey plastic areas you see on the case in the pictures and video above will be aluminum in the final design.